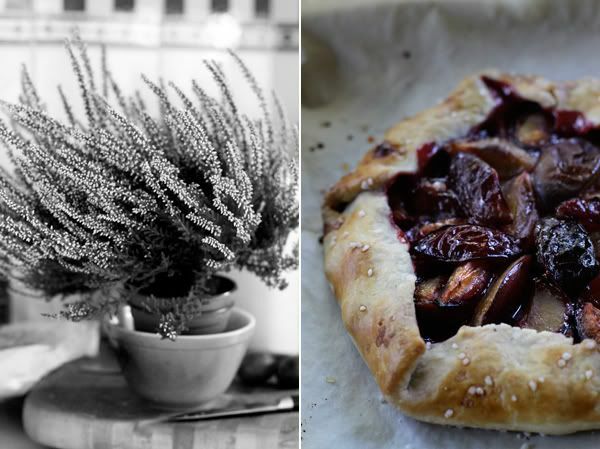 I told you that other dough ball would make an appearance soon, ta-da, a purple plum crostata. And actually I only used 1/2 of that leftover dough. It's just us. No need to overdo anything here. This of course means that I still have some dough, which will be put to good use this weekend when my dear friend Kerry arrives. Zürich is conveniently located travelwise, so much so that Kerry is stopping through on her way to Kenya. Stopping through, on her way to Africa to visit friends and write her book. Wow. 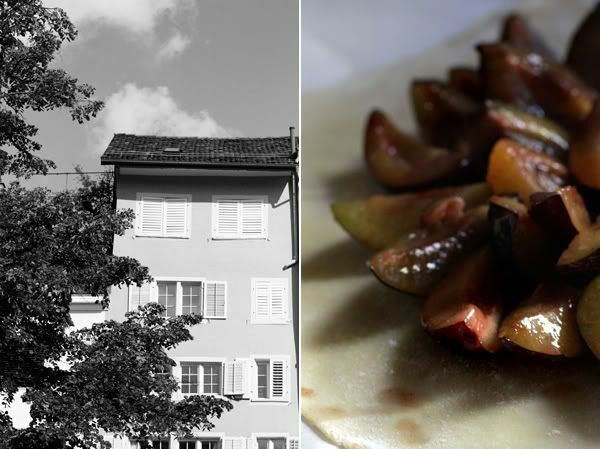 Zürich is a little layover vacation, a happy accident, a bonus. 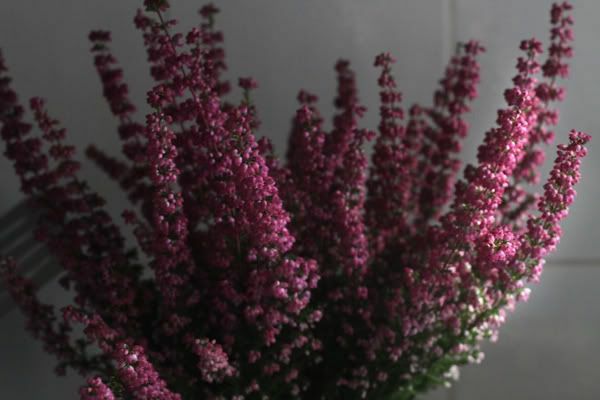 The days will be carefree, but full of all of those good, heart-warming things, like talking to an old friend, going for long walks, cooking a delicious meal and then enjoying it with wonderful company. There will be an excursion into the old town and one into the Alps. I'll show her all the chocolate shops and certainly my favorite bratwurst spot, where I'll warn her about the spicy mustard and instruct her to simply eat it out of the paper, like a meat stick, no bun required. Oh and there will be some birthday celebrations mixed in there. Mine! It's my first birthday abroad, and likely not my last. It certainly promises to be different than past birthdays, but I imagine it will still be full of joy and friends and cake! I like to joke that my birthday is not just a day, but a month. The happy-birthday-to-moi presents begin to be purchased in late August. A new sweater here, a pair of boots there, a bike, oh and that desk is really great let's get that too! All August, September and October purchases get bundled into the birthday present category. I blame it in part on the change of season and all of the back to school fall fashions that hit the market just as my birthday is coming around the corner. This isn't a new phenomenon. It's always been this way. I'd go shopping with my mom in August before grade school and all the sudden we were birthday shopping. This year it was exacerbated by the fact that I was moving to Zürich, one of the most expensive cities on the planet, and I just had to buy things in the states and bring them over. Happy Birthday to ME! Now instead of buying things I bake things! In a bowl mix the plum slices, cassis, sugar, corn starch and cinnamon. On a lightly floured surface roll out the tart dough into an 1/8" thick circle. Lift the dough and transfer to a baking sheet that has been lined with parchment paper. Starting 1" from the outside edge of the dough, arrange the plum slices in a a circular manner, moving towards the inside. Fold the dough over the sides and crimp down. Brush the dough with the egg wash.
Bake for roughly 35-40 minutes, until the crust is nicely browned. You didn't really expect that baking would make up for lost time birthday shopping, did you? I did buy myself a little present today, see above. I spotted this herringbone cowl and I just haaaaad to have it, or rather, make it. Of course I picked a challenging project to start with, but that's typical, because I'm not satisfied with the simple stuff. 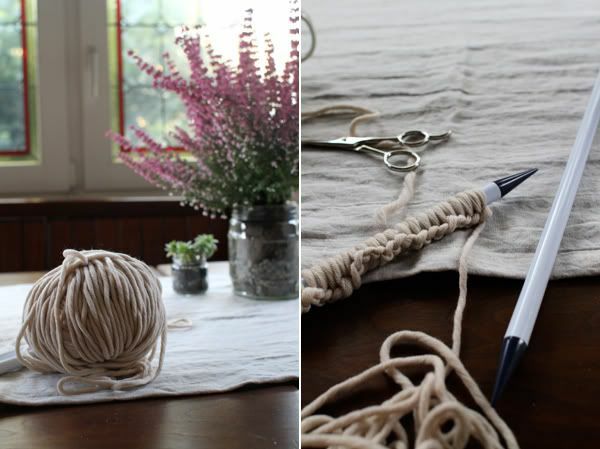 I have it in my mind that if someone out there can figure out how to do it then I can do it, it is just needles and yarn after all. Those will surely be my famous last words. I've already started over four times. If nothing else I will be really good at casting on. If we hadn't just bought a new desk and a couple new bikes and some plane tickets back to the states then I would certainly be gifting myself a sewing machine. My first project would be these linen pillows. We have four chairs and a church pew at our dinner table and while none of them have proper cushions the church pew is in need of a comfy makeover. Happy Birthday to me and happy wednesday to you! Wow that Cowl looks beautiful - I'm tempted to pick up my needles and make one....except I have about 15 other projects that are calling my name. 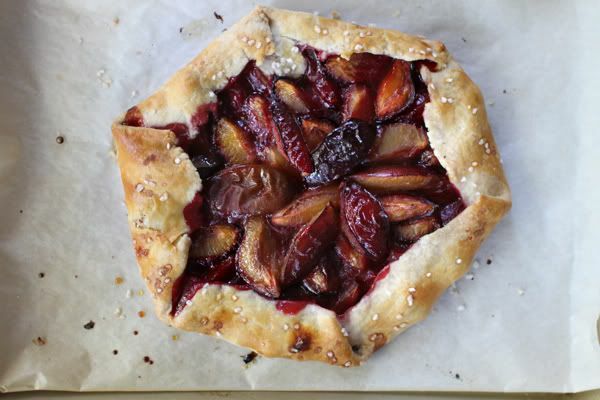 Talley, your crostata looks incredible. 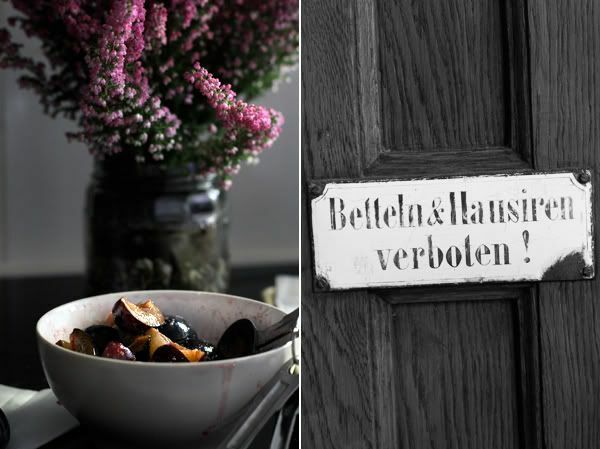 Your baking with plums inspired me and I am making the NY Times Plum Crumble right now. Happy Birthday! It was nice meeting you at the AWCZ. 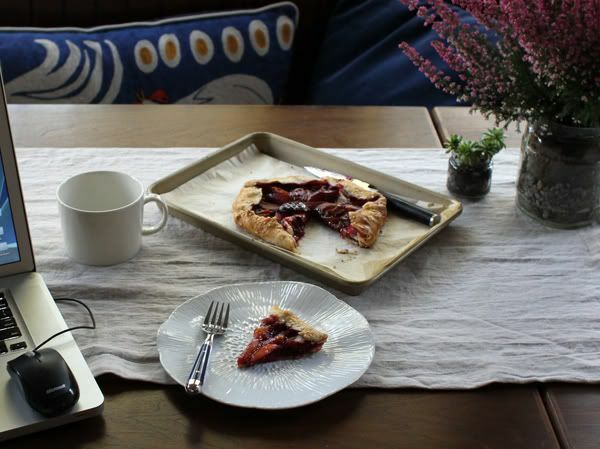 Your crostata looks delicious (with Zwetschgen, yum) and the knitting/sewing projects are perfect for the upcoming fall season. Lovely, dainty flowers you have there. What kind? 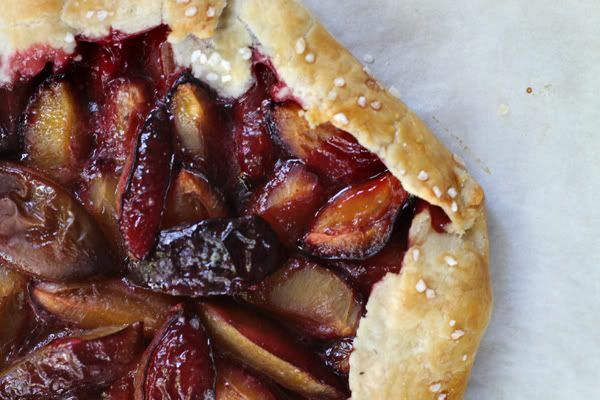 Perfect for a celebration with a Zwetschgen crostata. The dots of pearl sugar on the edges add a nice touch. Have you tried Zwetschgenknödel? Always tempted, though haven't found the courage. Thanks for the birthday wishes and comments everyone! Sorry for the tardy reply, I'm just getting back to blogging after a fun weekend with a friend. Amanda - I had a sense that you would love the cowl too! I've been working on my herringbone stich, man it takes a while to do 1 row, but then again I'm just picking up knitting again so maybe I'm just slow in general. Darcy - how did the NYTimes crumble come out? 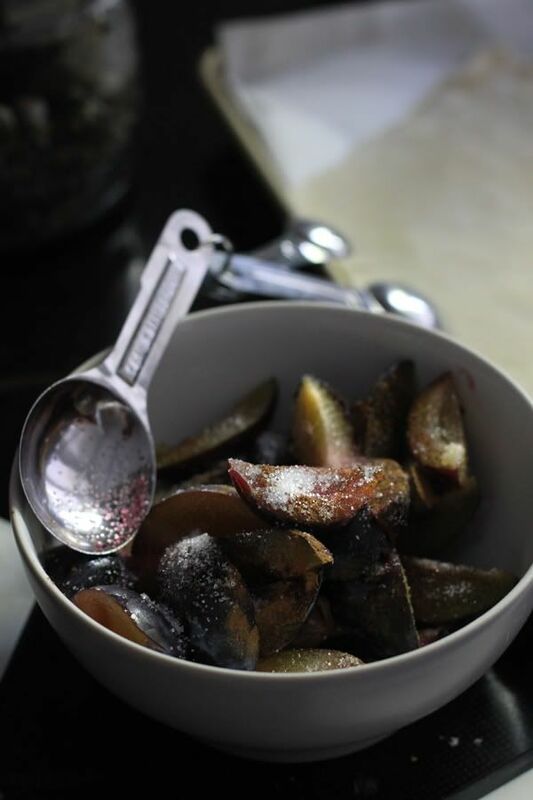 The plums are still in the market and I'm determined to make every plum dessert there is. Marien - Great to meet you as well! Hopefully I'll see you again soon. Heather - I just had to look up Zwetschgenknödel, because I had no idea what a knödel was. Thanks to you I've learned a new German word, dumpling. And I love dumplings so I'm sure that will come in handy. It does look like a tough dessert to tackle, especially since all the recipes I can find are in German.